One of the first things a traveler to Hawaii notices on their arrival at the airport or first visit to any convenience store is the huge displays of macadamia nut products, such as gift packs of dry roasted nuts, chocolate covered nuts, and macadamia nut brittle. The selection is almost endless and the prices are amazing, less than half of what you would pay on the mainland for the same items. How is this possible? Well, the answer is quite simple. Hawaii is still one of the world's largest producers of macadamia nuts and was once known as the macadamia nut capital of the world, growing 90 percent of the world's macadamia nuts. What makes this even more amazing is the fact that the macadamia nut tree is not native to Hawaii. In fact, it was not until 1882 that the tree was first planted in Hawaii near in Kapulena on the Big Island of Hawaii. 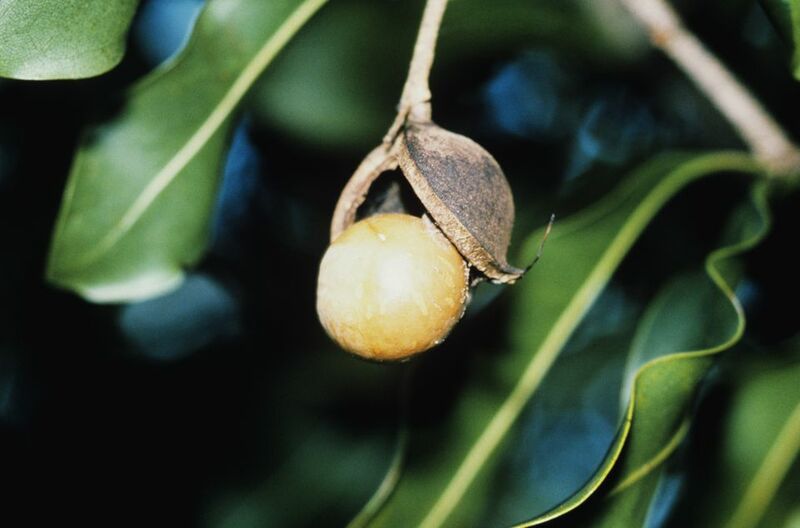 The macadamia nut tree originated in Australia. The macadamia was classified and named jointly by Baron Sir Ferdinand Jakob Heinrich von Mueller, Director for the Botanical Gardens in Melbourne and Walter Hill, first superintendent of the Botanic Gardens in Brisbane. The tree was named in honor of Mueller's friend, Dr. John Macadam, a noted lecturer in practical and theoretical chemistry at the University of Melbourne, and a member of Parliament. William H. Purvis, a sugar plantation manager on the Big Island, visited Australia and was impressed by the beauty of the tree. He brought the seeds back to Hawaii where he planted them at Kapulena. For the next 40 years, the trees were raised primarily as ornamental trees and not for their fruit. In 1921 a Massachusetts man named Ernest Shelton Van Tassell established the first macadamia plantation near Honolulu. This early attempt, however, met with failure, since seedlings from the same tree would often produce nuts of differing yield and quality. The University of Hawaii entered the picture and embarked upon over 20 years of research to improve the tree's crop. It wasn't until the 1950s, when larger corporations entered the picture, that the production of macadamia nuts for commercial sale became substantial. The first major investor was Castle & Cooke, owners of the Dole Pineapple Co. Soon after, the C. Brewer and Company Ltd. began their investment in macadamia nuts. Eventually, C. Brewer bought Castle & Cooke's macadamia operations and began marketing its nuts under the Mauna Loa brand in 1976. Since then, Mauna Loa's macadamia nuts have continued to grow in popularity. Mauna Loa remains the biggest producer of macadamia nuts in the world and their name is synonymous with macadamia nut products. There are, however, a number of smaller growers who produce nuts. One of the best known is a small farm on the island of Molokai owned by Tuddie and Kammy Purdy. It is an excellent place to stop to get a personal lesson about Macadamia nut cultivation, and to taste and purchase fresh or roasted nuts as well as other macadamia nut products.